InshAllah we hope to release a set of excerpts from the hours of audio recordings we have from the Ramadan Dowra we ran in both 2013 and 2015 with our teacher, Shaykh Khalid al-Turkestani (Allah protect him) from the sacred city of Mecca. Please find below an excerpt from the opening gathering in 2013 discussing sacrifices in the path of seeking knowledge which serves as a reminder for us all. The translation in this gathering was undertaken by Shaykh Thaqib Mahmood (Allah reward him). Shaykh Khalid was born in the city of Mecca where his ancestors had migrated to from Central Asia after it came under communist rule. He grew up in the Jarwal district of Mecca and whilst a university student was lead to his teacher, the great hadith master of his age, Shaykh Muhammad Yasin al-Fadani whose close company he kept for the last three years of his life. After his teacher’s passing he continued his studies with numerous other scholars, such as Sayyid Muhammad Alawi al-Maliki with whom he read a number of works in depth with commentary such as the whole of Sahih al-Bukhari; the whole of Mukhtasar Sahih Muslim of Imam al-Mundhiri; the whole of the Mishkat al-Masabih over an 18 year period of discipleship. He also studied Aqidah, Shafi fiqh, logic and other sciences with teachers such as Sayyid Ahmad al-Ruyqaymi as well as graduating from the Umm al-Qura university. He currently works as a primary school teacher in Mecca and is among the teaching staff in the private school in the home of Sayyid Abbas al-Maliki (Allah have mercy on him). We received the sad news yesterday of the passing of Shaykh Yaqub Ali Murad al-Balushi al-Makki, one of the senior most and elderly hanafi scholars of the sacred city of Mecca. Shaykh Yaqub was born in the Kerman region of Iran and travelled widely in pursuit of knowledge, acting as a judge in the city of Buraimi in current day Oman before settling in the sacred city of Mecca. He kept a low profile and shunned fame whilst at the same time serving students of knowledge who came to him. In the 1970s for example he tutored Shaykh Yahya al-Mulla during his student days in Mecca, reading with him works such as the Lubab and Maraqi al-Falah in their entirety. He was well known for his piety and zuhd, being well known for his performing 2 umrahs every day during the month of Ramadan. 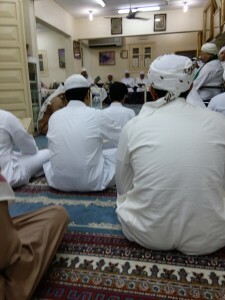 The picture above of Shaykh Yaqub was taken at a mawlid in his home in Mecca on the 12th of Rabi al-Awwal 2015 where the Barzanji mawlid and other qasaid were recited. May Allah Taala have mercy on him and give his family steadfastness at this time. Please find below a draft translation of a short poem on Sunni belief authored by a Meccan scholar. It succinctly sums up the basics a Muslim should know regarding their creed. I had begun annotating it with some comments from the author’s own commentary, but that is on hold at this current time. There are many courses being run in the UK on various topics related to islamic studies such as tafsir, the fiqh of worship, hadith etc, but very few on the topic of the fiqh of inheritance. When reflected on, this phenomenon is a little odd as the fiqh rules which relate to the division of property upon the death of a person apply to every Muslim and it could be argued in terms of importance and priority perhaps rank higher than many of the courses being delivered throughout the UK. “Learn inheritance and teach it for it is half the knowledge and it will be forgotten, and it is the first thing to be ripped from my Ummah” (Ibn Majah 2710). “Learn inheritance and teach it to people for I am a mortal being and knowledge will decrease until two people would differ amongst themselves over inheritance, but wouldn’t find an arbitrator” (al-Nasa’i 6305). We are therefore pleased to announce a new beginners course on learning the rules of calculating inheritance shares by means of studying forty of the most common inheritance scenarios. 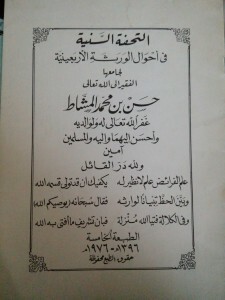 We will inshAllah be studying a text authored by the recent great scholar of Mecca, Shaykh Hasan al-Mashat. A sample typeset page from an upcoming project on a basic aqidah text inshAllah. More information to follow soon. InshAllah we hope to roll out in the near future a beginners course on the Islamic rules of Inheritance, an area which receives little attention amongst those who attend study circles and surrounding which there are a number of misconceptions. Alhumdulillah we have prepared the first draft of a translation of a text on this science which was authored for novices by the great Meccan scholar, Shaykh Hasan al-Mashat. Shaykh Hasan designed this work to be a gentle introduction to this field, and focuses his attention on forty scenarios of inheritance. 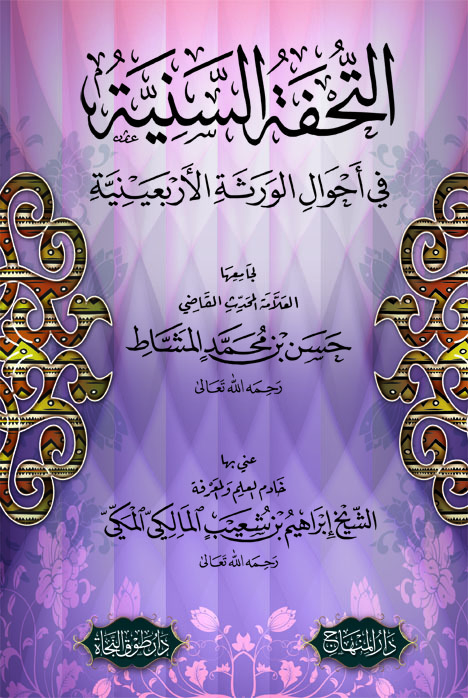 The draft translation has been supplemented with tables adapted from the commentary of Shaykh Muhsin al-Musawa who was a student of the author himself. The image above is of copy of this text we were grateful to receive recently, which was printed in the lifetime of the author (1976). Prayers are requested for the successful delivery of these workshops and utilising of this Mubarak text. Above is a picture taken at a mawlid in Mecca at the home of Sidi Fuad Ibrahim Usta in the month of Rabi al Awwal 2015. In the distance on the left you can just about make out the current principal of the Sawlatiyyah school Shaykh Majid Rehmatullah. I managed to have a brief conversation with him after the mawlid during which he clarified that the Sawlatiyyah is not aligned to either the Deobandi nor Barelwi schools of the subcontinent. Alhumdulillah it was a beautiful event with some talented young munshids in attendance. I have some recordings of the gathering but multiple attempts to upload here have been unsuccessful unfortunately.